Matantimali located in the village Matantimali in Central Sulawesi Province, Indonesia. 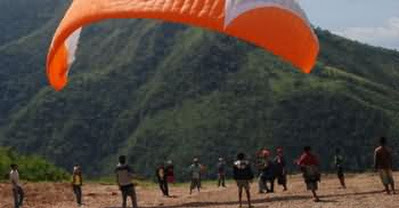 At the Indonesian National Sports Week (PON) XVII 27 June-5 July 2008 in East Kalimantan, a special branch of paragliding was specially moved to this location. The “take off” spot is at a hill facing the ocean to the east (southeast), at an altitude of 1100 meters above sea level. Although the condition is a little rocky and narrow, located at the tip of a very steep slopes provides many advantages for the lovers (and maniacs) of this sport. 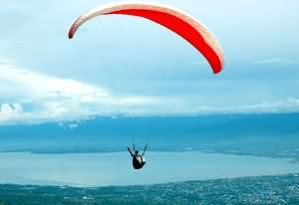 Another advantage of this location for the paraglider is the extremely easy transportation access, two or four-wheeled vehicle can easily reach this place (Matantimali), the location that’s facing the Palu valley and Palu bay (Palu is the capital city of Central Sulawesi, FYI) provides many benefits for paraglider: first is the wind that hit the mountain slopes, which causes turbulence (water waves), as the turbulence is always needed to get the height (altitude), and the second benefit is the geothermal bubble (heat). Both of these are well met in Matantimali, first is because it’s a mountainous area exposed to wind, which supports this region well, the second is thermal, hot weather (weather) in this region dominated much heat causing thermal on location. It takes approximately 30 minutes to go to Matantimali from the city of Palu towards the southwest. Along the journey to the location you will be presented with the natural panorama of mountains and the expanse of the Palu valley. If you think the panorama is beautiful, wait until you see it from above!.